Below is my entry for the Pixel Scapper November Blog Train. There are lots of different variations on this theme. I’d been wanting to create some word art and being that I’m into vintage things right now, wanted to work on old wood signs. Now, word art is something I’m new at, so I hope these sizes work. When I got done they were gargatuan beyond belief just a wee bit big! I trimmed them down until they looked okay to me on a regular 12×12 paper size. So, I hope they work for you. 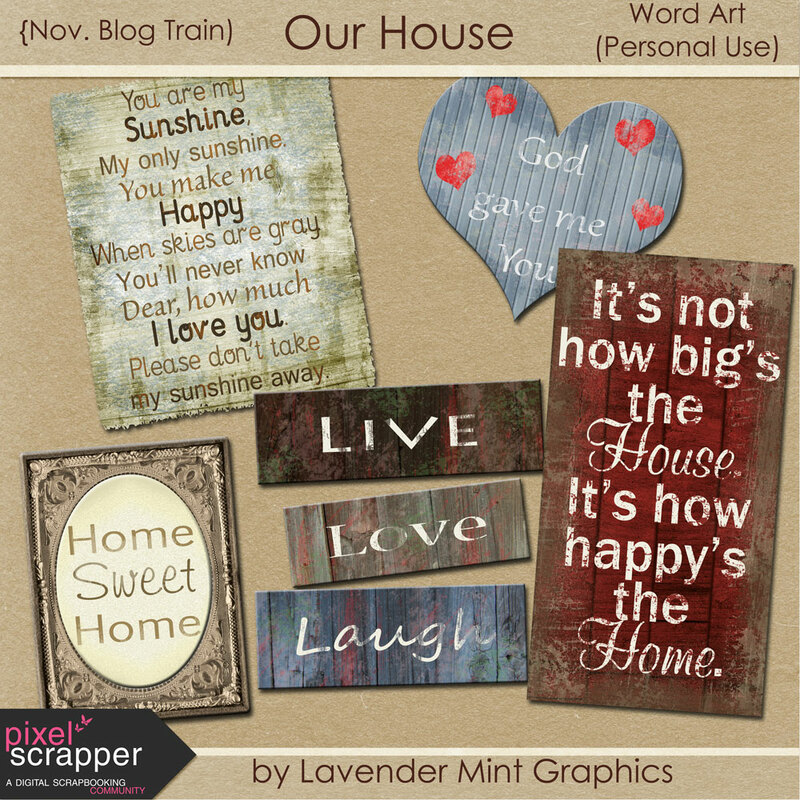 Please visit the other entries at the Pixel Scrapper November Blog Train. I’ll have a “Pass the Kit” Challenge we just completed soon – hopefully today. Happy Halloween and thanks for visiting! I love your word art – it’s lovely! And it’s so nice to get your email and know to come to your blog! You’re welcome, Faith, thank you for visiting! Hello My dear friend! Congratulations for these wonderful word art. I´m not downloading all the portions for this blog train, just the ones I like the most – and yours is one of my pics 🙂 I guess your WAs will be useful as soon as I can scrap again – Finding time for everything is being a challenge right now. And, if they´re scaled to a 12×12 size in the preview, they seem to have a good size to me. Keep going, you´re doing great! These are lovely, thank you very much! Fantastic word art!! I especially love the one about the size of the home!! Thank you so much for sharing!! Very sweet word art. Thank you! You’re welcome and thanks so much for visiting! Thank you for the lovely word art! I love the weathered look! Love the word art! Thank you! Thanks so much for your lovely wordart. I like the grungy look.